The state of religious consecration. It is the most essential element in worship; so that a divine service without it is "like to a body without a soul." To such as pray to God without the spirit of fervent devotion, the stern sentence is applicable: "With their mouth and their lips they honored me, but their heart they removed far from me" (Isa. xxix. 13). Devotion is the entire dedication of the worshiper to the service of God, the banishment of all other thoughts from the mind and heart, so that the whole inner life centers in the one idea of God's greatness and goodness (Ber. 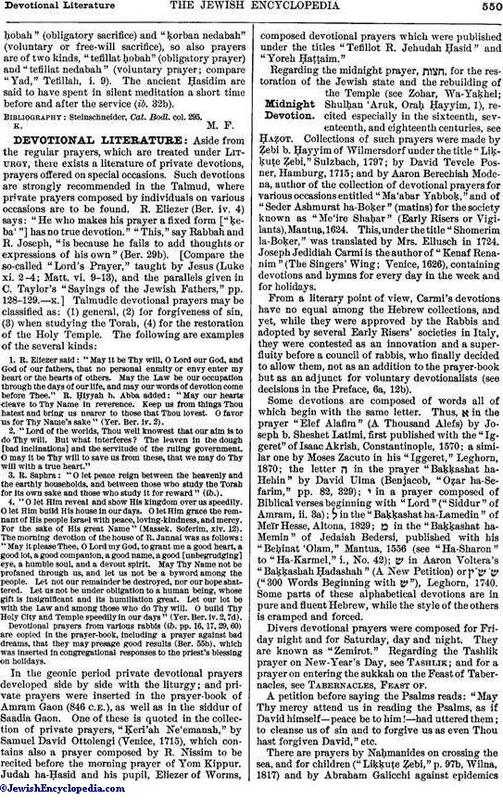 29b, 30a; Maimonides, "Yad," Tefillah, iv. 16). Every fulfilment of a divine commandment ("miẓwah") requires devotion or consecration of mind and heart to the sacred work to be done ("miẓwot ẓerikot kawwanah"; Ber. 13a, b; Meg. 20a; Ḥul. 31a, b; Yer. Yeb. viii., 9a). Hence the cabalists enjoined men, before fulfilling any commandment, to expressly consecrate the mind to the work by certain formulas (see Kawwanah; Loria, Isaac). 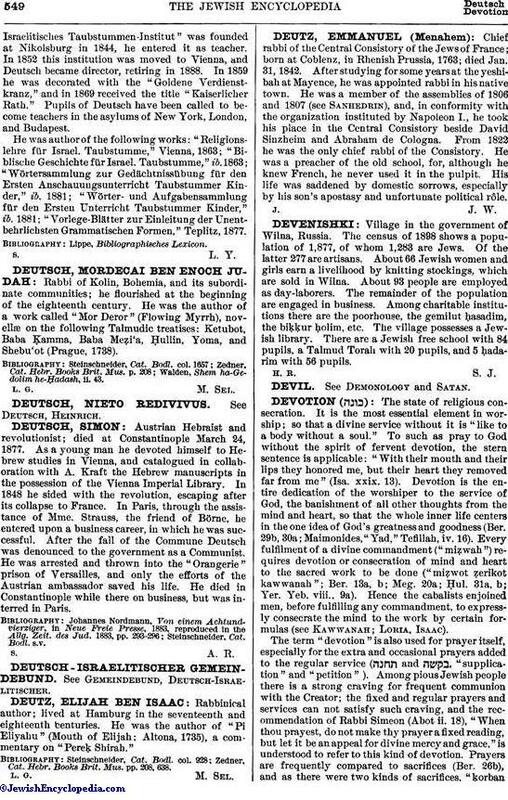 The term "devotion" is also used for prayer itself, especially for the extra and occasional prayers added to the regular service ( and , "supplication" and "petition"). Among pious Jewish people there is a strong craving for frequent communion with the Creator; the fixed and regular prayers and services can not satisfy such craving, and the recommendation of Rabbi Simeon (Abot ii. 18), "When thou prayest, do not make thy prayer a fixed reading, but let it be an appeal for divine mercy and grace," is understood to refer to this kind of devotion. Prayers are frequently compared to sacrifices (Ber. 26b), and as there were two kinds of sacrifices, "ḳorbanḥobah" (obligatory sacrifice) and "ḳorban nedabah" (voluntary or free-will sacrifice), so also prayers are of two kinds, "tefillat ḥobah" (obligatory prayer) and "tefillat nedabah" (voluntary prayer; compare "Yad," Tefillah, i. 9). The ancient Ḥasidim are said to have spent in silent meditation a short time before and after the service (ib. 32b). Steinschneider, Cat. Bodl. col. 295.